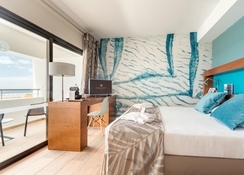 With a scenic setting, the Hotel Costa Calero Talaso & Spa features inviting sea view rooms, interconnected rooms and spacious suites to match the tastes of all the travellers. Crystal clear waters, marvellous landscapes and the uniquely shaped landscape by the artist Cesar Manrique are some of the exciting things, which can be explored while staying at Hotel Costa Calero Talaso & Spa. This 4-star resort offers superior quality rooms both for couples and families who prefer outdoor swimming pools and lush green gardens. This ultimately makes it more than just a good accommodation in Lanzarote. Beach lovers will need to travel only 5km to reach the beaches of Puerto del Carmen on the other hand the Timanfaya National Park is only 14km from the resort. 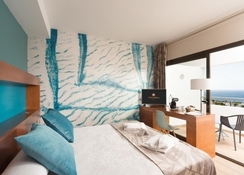 The Hotel Costa Calero Talaso & Spa is nestled in the heart of Puerto Calero, Las Palmas, Spain. The Arecife Ferry Port is only 25 minutes’ drive away, where you will find ferries departing to the Gran Canaria Island. The Lanzarote Airport is only 11.8km from the resort, making it convenient for the guests to board their flights on time. 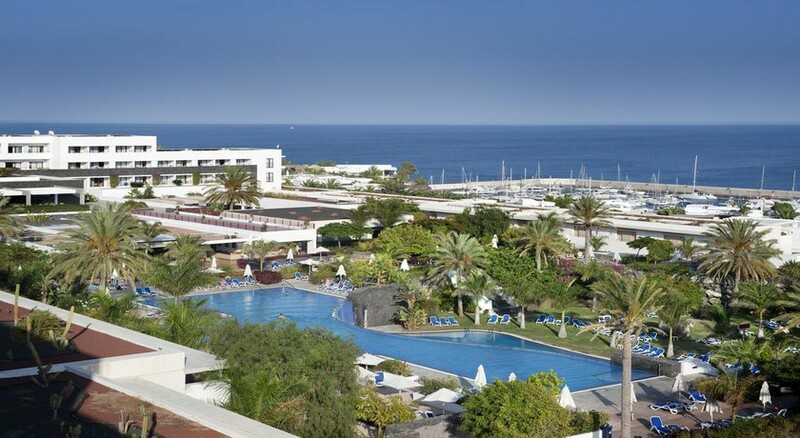 Golf lovers will not be disappointed either, as the Lanzarote Golf Club is just 10 minutes’ drive away. Whether you are a solo guest, couple, family, group of friends, you will surely find a room matching your requirements. The accommodation here is categorised as Double Room Sea View, Double Room Garden or Pool View, Double Room with Connecting Door, One Bedroom Suite, Family Suites – Two Bedroom Suites, Bottom of Form, Adapted Rooms for Guests with Reduced Mobility, Double Room Select, Junior Suite Select, Suite Select, Select Suite two-bedroom and Select interconnecting room. Amenities in the rooms include free Wi-Fi, air conditioning, mini fridge, 32″ LCD SAT TV, hair dryer, furnished balcony, Pikolín Vancouver mattress, NormActive system & Viscofoam, safety deposit box (charge), telephone, 24 hours’ reception and much more. The hotel houses two restaurants and four bars that satisfy different carving of different guests. The La Magdalena Restaurant is open for early buffet breakfast from 8am - 10:30am on the other hand the Oyambre Restaurant is open for late continental breakfast from 10:30am – 12 noon. Other than this, you can take advantage of the Bed & Breakfast, which is available for the independent guests. 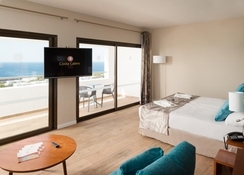 Some of the amenities in the restaurants include international buffet, show cooking, theme evenings, terrace, drinks served at the table, Canarian specialties, non-smoking areas and much more. The Bar Matalenas not only offers you a wide selection of local wines and cocktails, but also a range of entertainment shows from Sunday to Saturday. The Piano Bar Mouro is a nice place for enjoying cocktails, coffee and hot drinks in the late evening or in the night, while enjoying the spectacular sea view on the terrace. If you want to have refreshing alcoholic and non-alcoholic drinks after swimming, then you can take advantage of one of the pool bars namely Pool Bar Jameo and Pool Bar Puerto Chico. 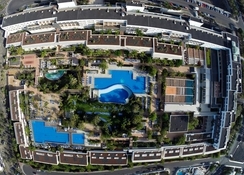 The hotel facilitates ample sports, entertainment and leisure facilities with a fully-fledged fitness centre, sport fishing, sailing or hire a bike to discover the place at your own pace. The Rubicon Diving centre is also not far away, which offers guided dives, diving courses and technical diving. Hit the Thalasso Spa for ultimate relaxation and rejuvenation, it is well equipped with waterfalls, chronotherapy, hydro massage beds, bubble chairs, foot jets, and special facial and body treatments to unwind your body and mind. 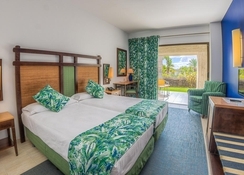 It will be an exciting stay for the golf lovers too, as two golf courses are close to the hotel, including Lanzarote Golf Costa Teguise and Golf Lanzarorte. Lovely clean and friendly hotel. Always plenty of sunbeds available around the pools so no need to be up at the crack of dawn to reserve one. The entertainment is great, never been anywhere before where it's been this good. A show every night and various activities during the day to take part in. Rooms are very clean and spacious. The food is the not the best !!!! Struggled on a few night so ended up eating out, not what you want to be doing when already paid an all inclusive price. Overall a good hotel just need to consider their food facilities. We arrived to be shown our rooms which were awful dark a long way from everything and being seniors was not good also the were semi underground I think they must have been staff quarters at some time .We complained and the very rude unhelpful Sophie on reception was not helpful in the end because we insisted we were eventually moved the next day.I had been several times to this hotel and always had good rooms in the actual hotel .